This chapter aims to provide perspective on the China and Taiwan issue in international politics and the two entities’ engagement with the underdeveloped world both historical and contemporary. The first subsection discusses the specifics of diplomatic recognition, in particu­lar, preferred legal interpretations and the reality of its application in international affairs. Taiwan’s precarious diplomatic situation will be understood within this context, as will wider trends impacting on the importance of diplomatic statute as a determinant of an entity’s inter­national profile. The second subsection deals with Taiwan’s current formal diplomatic relationships. Here, the book will begin to display some of the data collected in my research interviews. 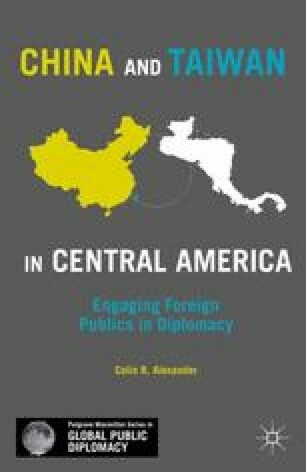 It will also pro­vide two short country case studies of Taiwan’s public diplomacy in formal diplomatic allies outside Central America. Thirdly, the subsec­tion provides substantial detail on the modern history of China and Taiwan’s engagement with the underdeveloped world. This begins in Africa in the 1950s where they competed for recognition from the newly independent states on the continent. There is also a discussion about Central America, and China’s limited historical role within the region. This will not only include an examination of the roles played by Taiwan and China in the various wars that plagued the isthmus during the latter half of the twentieth century, but will also cover Chinese migration to the Americas during the Gold Rush years. The final subsection will provide details about the diplomatic truce that is currently in place between Taiwan and China. All of these perspectives are at pains to provide some detail on their links to the main public diplomacy framework.